With What Is Leadership? you will be able to clearly define what it takes to be a leader and have unlimited access to the world’s top success coaches any time you want. With topics ranging from productivity and time management to positive thinking, this audio collection featuring several New York Times bestselling authors will give you the confidence to take your team to new heights and offer hours of inspiration and practical steps to power-up your influence in all areas of the workplace and beyond. 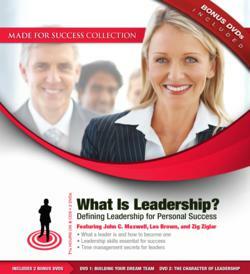 This 10-audio collection with 2 bonus DVDs features a collection of leadership recordings from John C. Maxwell, Les Brown, Zig Ziglar, Dr. Sheila Bethel, Brad Worthley, Mark Victor Hansen, Liv Montgomery, Dawn Jones, Laura Stack and Dr. Larry Iverson. Featuring a bonus video from the dean of motivators himself, Zig Ziglar, this leadership system comprises an award-winning catalog of speakers and authors. What Is Leadership? is the self-paced, proactive method for positioning yourself at the head of the pack—and making sure your scenery is always changing!